Your Biggest Packing Problems - Solved! SHOULD YOU TRAVEL WITH A SUITCASE OR A BACKPACK? AND WHAT’S THE BEST WAY TO KEEP YOUR ITEMS ORGANIZED? A Q&A SESSION WITH THE EAGLE CREEK STAFF PROVIDES SOLUTIONS! Whoever said, “Getting there is half the fun,” has clearly never wrestled with an overstuffed suitcase that just won’t zip, unpacked an entire backpack just to find a single sock, or fought with airport security over whether Chapstick is a liquid. Packing just isn’t easy. But hopefully the following tips will help make it less of a struggle. Below, Eagle Creek’s staff tackles some of your questions about putting together and living out of luggage. No matter how neatly I pack my outfits before a trip, my suitcase is always a disaster by day three. 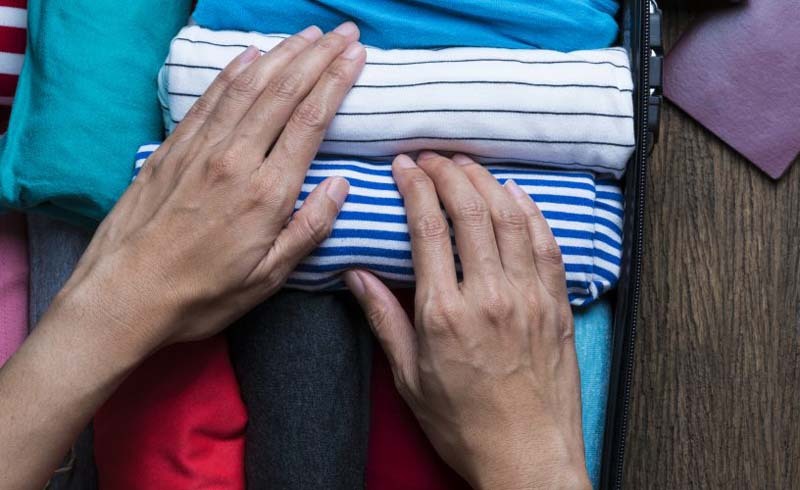 How can I keep my clothes more organized when I’m on the road? – John, Philadelphia Eric, Sales: Proper planning will save you time and headaches on the road—and so will Pack-It™. I use Pack-It organizers on all of my trips. They help me maximize the space I have and separate different types of clothing. Plus, their design allows me to get in and out of them without having to unpack everything. Here are the items I never leave home without: Pack-It™ Cubes, Folders, Sacs, Toiletry Kit and Compression Sacs. For work-related outfits, I use Folders, because they help minimize wrinkles and they're easy to access. For socks, underwear, winter scarves, hats, or anything that doesn't need to stay crisp, I use Cubes. I like to roll t-shirts because it allows me to fit more in the Cube, and it also helps minimize wrinkles. I usually lay my socks and underwear flat in the Cubes and place the rolled shirts on top of them. For non-clothing items, I use the Pack-It™ Sacs. These are where I stash my cords, adapters, snacks, and reading materials. The large Sac is awesome for books and magazines. My favorite toiletry kit is the Quick Trip, because it's simple, although the Wallaby is great for longer trips. That leaves us with the Compressor. This is great for dirty clothes. Or if you're feeling lazy and don’t want to spend the time to really fold or roll things, you could compress all of your clothes, since it reduces volume by 80%. What I love about this system is that I know where all of my stuff is at all times, so it's easy to access. Jason, Development: I use Pack-It™ Folders and Cubes to keep all my clothes organized. I put socks in a Tube Cube, briefs in a Half Cube, pants in a Cube, and shirts in a Garment Folder. I keep my shoes in either Shoe Sacs or individually in Stuffer Sacs. Jessica, Marketing: The Pack-It™ System is a godsend. I’ll admit I was a skeptic before, but now I’m a diehard fan of this line of products. What’s great about the Pack-It™ System is that no matter what type of trip I’m going on, there are products specific to what I’ll need to pack. Down jacket? There’s a Compression Sac. Something to separate my clothes from my muddy hiking boots? There’s a Shoe Sac or Shoe Cube. And then there are the essentials for every trip: Pack-It™ Cubes, Sacs, and my Folder. I’m leaving for a backpacking trip in Europe and staying at a hostel for the first time. I’m used to staying in hotels. Do I need to bring anything special with me? – Olivia, New Orleans Jason: Not really. Bring cheap flip-flops to wear in the communal shower. Pack-It™ Cubes would also help keep things organized in your backpack and make finding and packing your clothing easier to manage. Jessica: Hostels and hotels often offer the same basic amenities, but hostels have less privacy. I’m a huge fan of the lower rates that hostels offer! I’ve taken a travel backpack with me before, which is awesome, but sometimes it’s nice to be able to roll a bag when I want to and carry a backpack when I have to. For that reason, I would suggest bringing the Switchback™ wheeled bag it’s really versatile and converts to a backpack. One of the coolest things about this bag is that it also has a detachable, zip-off backpack. Other things that are nice to have for a hostel stay are TSA-approved locks to protect the contents of your bags, and earplugs and an eye maskso that when your neighbors are snoring in the next bed over (or through the wall), you can get your much-needed sleep. A quick-dry travel towel is also super important. Pick up the XL size to dry off after a shower, because other towels are a bit small to ensure modesty. I hate paying extra to check my bag, because then I worry about it getting lost. Do you have any tips for packing light and saving suitcase space, so I can fit everything in my carry-on? – Margaret, Rochester Eric: Once again, take advantage of the Pack-It™ System, which will save you money at the airport by helping to maximize the space in any bag. I'd also recommend bringing a Packable backpack. It folds up into a small pouch (the size of your palm), so you can easily fit the pouch in a suitcase. If you end up buying stuff on your trip, expand the pouch into a backpack and use it as a second carry-on. Jason: I wear my bulky items and pack my less bulky items. So I'll wear jeans and dress shoes on the plane, and then I’ll pack my casual clothes, running shoes, and flip-flops. I make sure that I can combine outfits with both dress and casual wear when possible to cut down on the number of items I need to bring. Jessica: Um, yes! Check out yours truly in a “how to” on packing light and getting organized. It may change your life! No matter how often I do it, flying always makes me nervous, and all the lines and hassle at the airport only make it worse. What can I pack to make my journey through the airport and my time on the airplane go more smoothly? —Kathryn, Albany Eric: I travel a lot, and knowing that I have what I need in the right place eases my anxiety on the go. Pack-It™ will help you organize your clothing and miscellaneous items and, if you’re stopped at security, it will often help you move through the line faster. I'd also recommend a Checkpoint Friendly personal item. These products have features that allow you to keep your electronics in your bag when going through security. The features are TSA-approved and have saved me a ton of time at the airport. Minimizing stress is one thing to think about. The next is staying comfortable. Pack a blanket, pillow, eye shade, and ear plugs to make your flight more enjoyable. Put in-flight amenities in a Pack-It™ Sac, which you can stash in the seat pocket in front of you for easy access. Anticipate the things that make you uncomfortable and prepare. Some ideas for a comfortable trip: Wear slip-on shoes with socks, try not to wear a belt or jewelry, have the airline email or text you notifications, and try to book a window or aisle seat. Jason: An iPod loaded with podcasts or your favorite music and an iPad with e-books or your favorite movies is essential. The other thing I highly recommend is a Global Entry Card. This allows you to take express lines through TSA checkpoints on certain airlines at certain airports domestically. This also means that you don't have to take out your computer, take off your shoes, belt, or jacket, or remove your 3-1-1 toiletry pouch. It also allows you to use Global Entry kiosks when returning from international trips—no standing in the long immigration line. You walk up to the kiosk, enter your information, and in less than 2 minutes you either get your checked bag or go straight to the customs officer in a line used by only Global Entry members. In an airport like LAX at the Tom Bradley International Terminal, you’ll be hailing a cab within just 10 to 15 minutes of exiting the plane with carry-on luggage. It’s the best $100 I've spent in a long time. Jessica: You can do things to make sure that you get through TSA quickly, like use the Pack-It™ System to keep your carry-on organized, but I personally like to focus on my comfort on the plane. I always fill up my water bottle before takeoff. (Make sure to do it after going through security.) Knowing I can hydrate when I need to helps ease my mind. That leads me to my next point: If you know you’re a frequent bathroom user, choose an aisle seat. If you forgot to pick a seat when you purchased your ticket, chances are you’ll be able to buy an upgraded seat once you get to the airport. Also, travel pillows and blankets for red-eye trips are a must. Though some airlines still provide these, there isn’t always one available for every customer, and nothing is worse than an uncomfortable night of no sleep. Earplugs are must-haves. If you forget them, no worries—just use your trusty iPhone earbuds. They can also work well to block out most of the sound. I’m torn. I love suitcases for ease when moving through airports and hauling all my stuff along city streets, but it’s great to have a backpack for short hikes and day trips. Which kind of bag do you recommend? — Sarah, Amherst Eric: Packables are great for short hikes and day trips because they're just the right size for your essentials, they’re lightweight, and they fold up into small pouches for easy storage. Toss them into your suitcase (they take up very little space), and then if you want to use one on your trip, you can expand it and fill it up. Jason: If you like wheels, then carrying items isn't the best option. And, in my opinion, a backpack that's big enough to be a piece of luggage is too big for day hikes or day trips. For me, I'd have a 22" Upright and a Packable Daypack that I can put into my Upright without taking up critical packing space. Jessica: Use a Switchback™! It’s a wheeled bag that converts to a backpack and has a zip-off day bag. It sounds like this bag was made for you. Do you have any burning packing questions? Ask us in the comments below, and we’ll use them for our next edition! 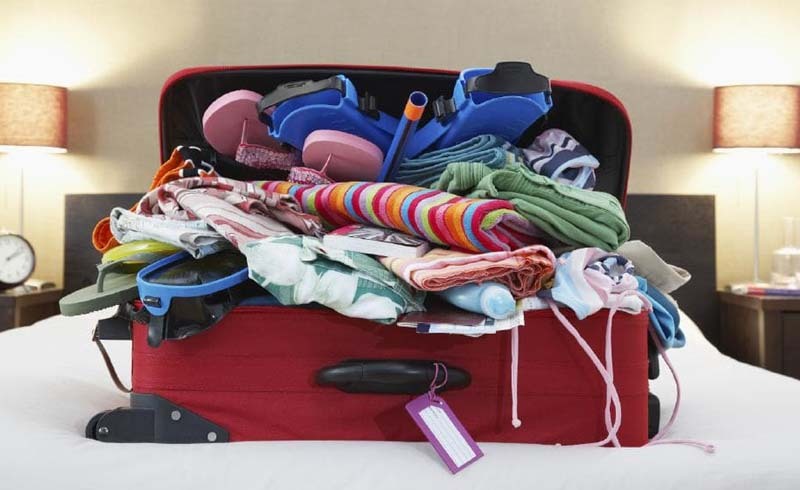 U.S. Daily News: Your Biggest Packing Problems - Solved!